Our organization offers a superior range of Conveying Systems to our clients, which is manufactured using best grade raw materials. It is equipment that moves materials move from one location to another, our range of conveying systems are used in many industries. These are available in different specifications that meet the individual requirement of our clients in the best possible manner. We supply these systems at competitive prices. We offer Screw Conveyors which are especially used in transportation of granular, pulverized and less frequently various small size lumpy bulk materials to comparatively short distance in different industries like chemical, building materials and flour industries. Our range of screw conveyors are demanded in large scale because of its features like precise engineering, optimum strength, and durability. We manufacture and export from mild steel plates, our screw conveyors are useful in the functioning of the oil mill plants. 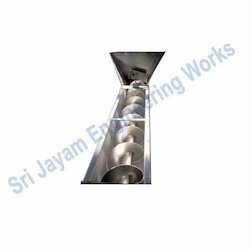 Our screw conveyors are available in various sizes, capacities and specifications. Looking for Conveying Systems ?